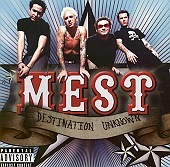 Produced by Goldfinger's John Feldmann, Mest's Destination Unknown is a blazing, hook-laden pop-punk record, not unlike Goldfinger. Though not as flavorful or diverse as Goldfinger, Mest take on pop-punk and win, delivering an album chalk full of sing-along anthems, lyrics worth paying attention to, and fun antics to keep you from getting bored. If the cookie cutter pop-punk bands that Epitaph and Fat Wreck Chords started signing after they became the kings of the sub-genre killed punk, bands like Mest (and Goldfinger, for that matter) are helping to restore its vitality. If only because it's so darn catchy, you should give this a spin. I'll give it a B.